It is widely accepted that cAMP regulates gene transcription principally by activating the protein kinase A (PKA)-targeted transcription factors. Here, we show that cAMP enhances the generation of 5-hydroxymethylcytosine (5hmC) in multiple cell types. 5hmC is converted from 5-methylcytosine (5mC) by Tet methylcytosine dioxygenases, for which Fe(II) is an essential cofactor. The promotion of 5hmC was mediated by a prompt increase of the intracellular labile Fe(II) pool (LIP). cAMP enhanced the acidification of endosomes for Fe(II) release to the LIP likely through RapGEF2. The effect of cAMP on Fe(II) and 5hmC was confirmed by adenylate cyclase activators, phosphodiesterase inhibitors, and most notably by stimulation of G protein-coupled receptors (GPCR). The transcriptomic changes caused by cAMP occurred in concert with 5hmC elevation in differentially transcribed genes. Collectively, these data show a previously unrecognized regulation of gene transcription by GPCR-cAMP signaling through augmentation of the intracellular labile Fe(II) pool and DNA hydroxymethylation. Cyclic AMP (cAMP), the second messenger, converts the binding of ligands with many different G-protein coupled receptors (GPCRs, also known as seven-transmembrane domain receptors) into various biological activities (Sutherland, 1970). Principally, cAMP exerts its function through three major targets − cAMP-dependent protein kinase A (PKA), cyclic nucleotide-gated ion channels (CNGCs), and exchange protein directly activated by cAMP (Epac). It is well known that cAMP has an impact on gene transcription, which is currently considered to be mediated by the PKA-targeted transcription factors (Montminy, 1997). Three transcription factors, including cAMP response element-binding protein (CREB), cAMP response element modulator (CREM), and activating transcription factor 1 (ATF1), can be phosphorylated by PKA and subsequently bind to cAMP response elements (CRE) in gene promoters, generally to activate gene transcription (Sands and Palmer, 2008). Schwann cells form the myelin sheath of axons within the peripheral nervous system. cAMP is a known instructive signal for Schwann cell differentiation into a myelinating phenotype (Jessen et al., 1991). cAMP directly induces cell cycle arrest along with the expression of a wide variety of myelination-associated genes such as Egr2/Krox20, a transcription factor that is considered a master regulator of the myelin program, and myelin protein zero, the main peripheral nerve myelin protein (Bacallao and Monje, 2015). However, the mechanism by which cAMP regulates transcription and promotes the differentiation of Schwann cells is not fully understood. DNA methylation is one of the major epigenetic marks that regulates gene transcription. Active DNA demethylation is catalyzed by ten-eleven translocation (Tet) methylcytosine dioxygenases, which oxidize 5-methylcytosine (5mC) to 5-hydroxymethylcytosine (5hmC) (Tahiliani et al., 2009; Kriaucionis and Heintz, 2009), and further to 5-formylcytosine (5fC) and 5-carboxylcytosine (5caC) (He et al., 2011; Ito et al., 2011). 5fC and 5caC are ultimately replaced by unmodified cytosine (5C) to complete cytosine demethylation (Pastor et al., 2013). It is noteworthy that 5hmC is also a unique epigenetic mark with regulatory capacities in addition to being a DNA demethylation intermediate (Shen et al., 2014). Tet belongs to the iron and 2-oxoglutarate (2OG, alternatively known as α-ketoglutarate)-dependent dioxygenase family which utilizes labile Fe(II) as a cofactor and 2OG as a co-substrate. We and others have shown that ascorbate, which has the capacity to reduce the redox-inactive Fe(III)/Fe(IV) to Fe(II), is another cofactor for Tet (Minor et al., 2013; Yin et al., 2013; Blaschke et al., 2013; Dickson et al., 2013; Chen et al., 2013). Thus, ascorbate has an impact on DNA demethylation by promoting the availability of redox-active Fe(II) to Tet. 5mC and 5hmC are major epigenetic marks that govern both cell identity and cellular phenotype transformation. Thus, it is plausible that such marks are involved in the transition of Schwann cells from the immature to myelinating phenotype. Similar to cAMP, ascorbate was identified as another essential factor for Schwann cells to initiate and promote myelin formation (Bunge et al., 1986). Intracellular ascorbate deficiency can cause hypomyelination in modeled rodents (Gess et al., 2011). It is plausible that, by regulating DNA demethylation, ascorbate alters the cellular phenotype of Schwann cells towards a myelinating state. Based on this shared function in enhancing Schwann cell myelination, we reasoned that cAMP, like ascorbate, might also play a role in Tet-mediated DNA demethylation. Here, we investigated the potential role of cAMP in DNA demethylation. We identified that cAMP enhanced the generation of 5hmC in cultured Schwann cells. The effect of cAMP on 5hmC was not limited to Schwann cells but is likely a general effect, as it has been verified in other cell types. cAMP promptly increased the intracellular labile Fe(II) pool (LIP) independently of major cAMP targets but likely through RapGEF2 to enhance the acidification of endosomes and subsequently elevate the LIP, suggesting that an increase in labile Fe(II) over basal levels could mediate the effect of cAMP on 5hmC by activating Tet activity. The effect of cAMP on Fe(II) and 5hmC was mimicked by the addition of AC activators and phosphodiesterase (PDE) inhibitors such as caffeine. Stimulation of Schwann cells with isoproterenol or calcitonin gene-related peptide (CGRP), two ligands known to increase intracellular cAMP through Gs-coupled receptors (Cheng et al., 1995), elevated levels of intracellular labile Fe(II) and 5hmC. Furthermore, stimulation with cAMP caused a genome-wide shift in 5hmC profile, which correlated with a majority of the differentially expressed transcripts in Schwann cells. In the absence of cAMP treatment, 5hmC was barely detectable by dot blot in primary cultured rat Schwann cells. However, after treatment with membrane-permeable 8-CPT-cAMP (hereafter denoted as cAMP) (100 μM), 5hmC signal emerged at comparable levels to cells treated with ascorbate (50 μM, Figure 1A and B). Encouraged by this initial observation, we investigated the role of cAMP on 5hmC by immunofluorescence (IF). The addition of cAMP (0–250 μM) dose-dependently increased 5hmC generation in Schwann cells (Figure 1C and D). The IF signal for 5hmC was sustained for 1–7 days upon continuous cAMP (100 μM) treatment (Figure 1E and F), suggesting that continuous cAMP treatment largely maintained 5hmC. An enhanced generation of 5hmC was also verified in other cell types examined, such as HEK-293 cells, mouse embryonic fibroblasts (MEF) and neuroblastoma SH-SY5Y cells, indicating that the effect of cAMP on 5hmC is not limited to Schwann cells and is likely to be a general effect (Figure 1—figure supplement 1). cAMP induces 5hmC in cells. (A) Dot-blot shows that treatment with ascorbate (50 μM) for 3 days or cAMP (100 μM) for 7 days induced 5hmC in Schwann cells. (B) Semi-quantification of the dot-blot shows that both cAMP and ascorbate enhanced 5hmC generation in Schwann cells. (C) cAMP (10–250 μM) increased 5hmC in Schwann cells after 7 days treatment shown by IF. (D) IF quantification indicates the dose-dependent effect of cAMP on 5hmC in Schwann cells. (E) cAMP (100 μM) treatment for 1–7 days increased 5hmC in Schwann cells. (F) IF quantification shows that the effects of cAMP treatment from 1 to 7 days induces comparable effects on 5hmC in Schwann cells. (G) Endogenous cAMP promotes 5hmC in Schwann cells. AMP (100 μM) treatment for 2 days did not induce 5hmC while AC activators (forskolin (100 μM), bicarbonate (50 mM)), and PDE inhibitors (caffeine (100 μM), IBMX (100 μM)) enhanced 5hmC generation. (H) IF quantification indicates that forskolin, bicarbonate, caffeine and IBMX increase 5hmC in Schwann cells. *p<0.0005. Scale bar = 20 μm (n = 3 independent experiments with three biological replicates in each group, error bars denote standard deviation). We next tested whether the elevation of endogenous cAMP imparts a similar effect as exogenously applied cAMP. Treating cells with forskolin, which directly activates transmembrane adenylate cyclase (AC) to produce endogenous cAMP, promoted 5hmC generation in Schwann cells as did bicarbonate, an activator of soluble AC (Figure 1G and H). The production of 5hmC was also observed when cells were treated with phosphodiesterase (PDE) inhibitors caffeine or IBMX, both of which prevent cAMP degradation. Conversely, no 5hmC signal was observed after cells were treated with AMP (100 μM). Collectively, these observations suggest that endogenous cAMP is indeed involved in 5hmC generation. The increase in 5hmC generation by cAMP treatment appeared to last for days. To test whether the long-term effect on 5hmC relies on the continuous presence of cAMP or forskolin in the media, we treated Schwann cells with forskolin (10 μM) for 3–24 hr followed by washout. An increase of 5hmC was detected at both 24 or 72 hr time points, which is comparable to continuous treatment for 24 or 72 hr (Figure 1—figure supplement 2). Shorter treatments (1–4 hr) with cAMP (10 μM) or forskolin (10 μM) followed by washout also induced 5hmC elevation at levels comparable to continuous treatment for 24 hr in HEK-293 cells (Figure 1—figure supplement 3). However, unlike in Schwann cells, 5hmC level appeared to retreat toward the base line at the 72 hr time point in the fast replicating HEK-293 cells. Since 5hmC is not maintained during DNA synthesis, it is thus reasonable that 5hmC could be kept longer in the slowly dividing Schwann cells after termination of cAMP signaling. These experiments suggest that cAMP can produce a persistent increase in 5hmC, which can be detected within a few hours after treatment and last for several days depending on cell types. To understand how cAMP enhances 5hmC generation, we first examined the transcription of Tet. mRNA levels of Tet2 and Tet3 were decreased, whereas Tet1 mRNA remained unchanged after treatment with cAMP (100 μM) for 1 day (Figure 1—figure supplements 4 and Figure 1—source data 1), a time point at which cAMP clearly promoted 5hmC generation (Figure 1E and F). Thus, the increased level of 5hmC does not appear to be mediated by an effect of cAMP on the expression of Tet. In healthy cells such as primary cultured Schwann cells, the most plausible rate-limiting factor for Tet’s enzymatic activity is the replenishment of the Fe(II) cofactor rather than 2OG, a relatively abundant intermediate of the Krebs cycle. We thus hypothesized that cAMP may increase access to bioavailable Fe(II), as does ascorbate. To test this hypothesis, we used two different chemical probes for assaying bioavailable Fe(II). The first probe is Trx-Puro (Spangler et al., 2016), a recently developed reactivity-based probe that is highly specific for redox–active labile Fe(II) within the cell. Reaction of Trx-Puro with labile Fe(II) unmasks the aminonucleoside puromycin through a Fenton-type reaction. Released puromycin is incorporated in cellular proteomes, which can be visualized using a convenient IF assay (Spangler et al., 2016). Treatment with cAMP at a dose as low as 1 μM increased intracellular labile Fe(II), which reached even higher levels after treatment with 10–100 μM cAMP (Figure 2A and B). Incubation of the cells with Diox-Puro (Spangler et al., 2016), a dioxolane control conjugate that is non-peroxidic, showed no IF signal after cAMP treatment indicating the Fe(II) dependence of the signal detected by Trx-Puro (Figure 2—figure supplement 1). The action of cAMP on intracellular labile Fe(II) was rapid. Fe(II) signal appeared within 2 hr (the minimal time for simultaneous incubation of cAMP and Trx-Puro) and peaked at 4 hr after cAMP treatment (Figure 2C and D). Similar to 5hmC, the effect of cAMP on intracellular labile Fe(II) was also validated in other types of cells including HEK-293, MEF, and SH-SY5Y (Figure 2—figure supplement 2), suggesting that it is likely a general effect. cAMP increases the intracellular labile Fe(II) pool in cells. (A) cAMP (1–100 μM) treatment for 4 hr increased the intracellular labile Fe(II) pool detected by Trx-Puro ferrous iron probes. (B) IF quantification shows the dose-dependent effect of cAMP on labile Fe(II). (C) cAMP (100 μM) treatment for 2–24 hr increased labile Fe(II). (D) IF quantification shows the peak effect of cAMP on labile Fe(II) after treatment for 4 hr. Scale bar = 20 μm. *p<0.0005 (n = 3 independent experiments with three biological replicates in each group, error bars denote standard deviation). We then applied another method to verify the effect of cAMP on labile Fe(II). The recently developed FIP-1 probe links two fluorophores through an Fe(II)-cleavable endoperoxide bridge, where Fe(II)-triggered peroxide cleavage leads to a decrease in fluorescence resonance energy transfer (FRET) from the fluorescein donor to Cy3 acceptor by splitting these two dyes into separate fragments (Aron et al., 2016). 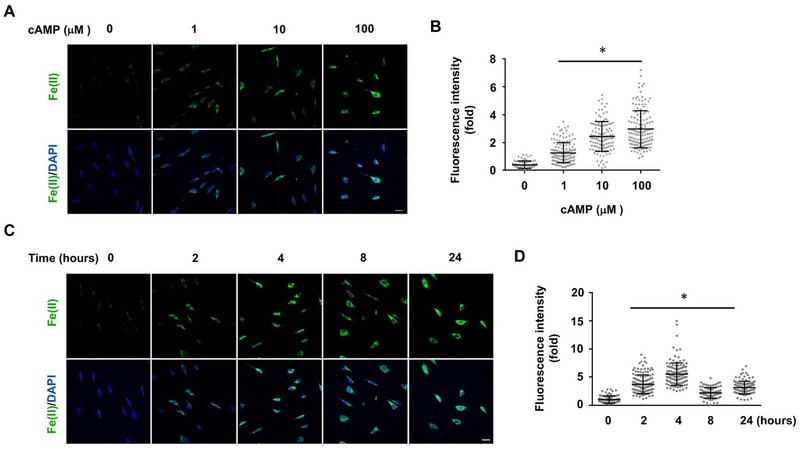 Using the FIP-1 probe, a significant increase of labile Fe(II) was detected in cells after treatments with cAMP (10, 100 μM) for 4 hr (Figure 2—figure supplement 3). Taken together, the results from two different independent chemical methods verified that cAMP treatment likely elevated labile Fe(II) in the cell. Treatment with AMP had no observable effect on labile Fe(II). Elevating endogenous cAMP also augmented intracellular labile Fe(II), as demonstrated by the treatment of Schwann cells with AC activators (forskolin, bicarbonate) and PDE inhibitors (caffeine, IBMX) (Figure 3A and B). To further examine the time course of labile iron response to cAMP, we treated Schwann cells with forskolin (10 μM) for 3 hr followed by washout. Labile Fe(II) immediately increased after the treatment but quickly declined back to the baseline levels after another 3 hr (Figure 3—figure supplement 1). These results suggest that the effect of cAMP on labile Fe(II) elevation is relatively transient. Alternatively, intracellular labile Fe(II) might be tightly controlled within the cell and therefore any increase in the LIP would not last a long time. Induction of labile Fe(II) by endogenous cAMP and the dependency of 5hmC generation on labile Fe(II). (A) AMP (100 μM) treatment for 4 hr did not induce labile Fe(II) while AC activators (forskolin (100 μM), bicarbonate (50 mM)) and PDE inhibitors (caffeine (100 μM), IBMX (100 μM)) increased labile Fe(II) detected by Trx-Puro probes. (B) IF quantification indicates the elevated labile Fe(II) by forskolin, bicarbonate, caffeine, and IBMX. (C) Pretreatment with iron chelators 2,2, bipyridyl (20 μM) and deferoxamine (20 μM) for 20 min blocked the elevation of labile Fe(II) and 5hmC in Schwann cells by cAMP (100 μM) treatment. (D) IF quantification indicates the inhibition of iron chelators on the induction of labile Fe(II) by cAMP. (E) IF quantification indicates the inhibition of iron chelators on the induction of 5hmC by cAMP. Scale bar = 20 μm. *p<0.0005 (n = 3 independent experiments with three biological replicates in each group). Ascorbate at physiological levels has been shown to have no obvious influence on intracellular labile Fe(II) (Spangler et al., 2016). Indeed, no obvious change in the intracellular labile Fe(II) pool was observed in Schwann cells after treatment with ascorbate at a physiological concentration (50 μM) (Figure 3—figure supplement 2), suggesting that ascorbate may only increase the bioavailability of Fe(II) to Tet and other enzymes locally. To determine whether cAMP promotes 5hmC generation via labile Fe(II), Schwann cells were treated with two different iron chelators 2,2, bipyridyl (20 μM) and deferoxamine (20 μM) prior to cAMP stimulation. These iron chelators drastically decreased the level of labile Fe(II) and further abolished the effect of cAMP on 5hmC in Schwann cells (Figure 3C and D). The abolishing effect of the iron chelators on cAMP-induced 5hmC generation was also verified in other cells such as human melanoma A2058 cells (Figure 3—figure supplement 3). These results suggest that cAMP upregulates 5hmC by elevating intracellular labile Fe(II). cAMP increases the intracellular labile Fe(II) by enhancing endosome acidification. The molecular mechanism by which cAMP alters labile iron in principle could be related to iron uptake and storage in the cell. Cellular uptake of iron is a complicated cascade involving the internalization of transferrin-transferrin receptor complex and Fe(III) discharge from transferrin after the acidification of endosomes, via vacuolar H+-ATPase (V-ATPase, the H+ pump). Subsequently, Fe(III) is converted to Fe(II) by Steap3 and leaves the endosome via divalent metal transporter 1 (DMT1) to enter the LIP (De Domenico et al., 2008). One key step in iron uptake is endosome acidification. cAMP treatment consistently decreased the pH in endocytotic vesicles as measured using vesicle pH indicator that emits increasing levels of fluorescence as pH decreases from 8 to 4 (Figure 4A). These results suggest that cAMP enhances the acidification of endosomes, which could underlie the elevated LIP. cAMP increases labile Fe(II) and 5hmC by enhancing the acidification of endosomes. (A) cAMP (100 μM) treatment decreases the pH in intracellular vesicles. Red fluorescence increases when the pH decreases from 8 to 4. (B) V-ATPase inhibitor Bafilomycin A1 (200 nM) pretreatment for 30 min blocks the effect of cAMP on both labile Fe(II) detected by Trx-Puro probes and 5hmC in Schwann cells. (C) IF quantification indicates the inhibition of Bafilomycin A1 on labile Fe(II) elevation by cAMP. (D) IF quantification indicates the inhibition of Bafilomycin A1 on 5hmC induction by cAMP. Scale bar = 20 μm. p<0.0005 (n = 3 independent experiments with three biological replicates each). We then tested whether elevated labile Fe(II) and 5hmC by cAMP signaling is mediated by enhanced endosome acidification. 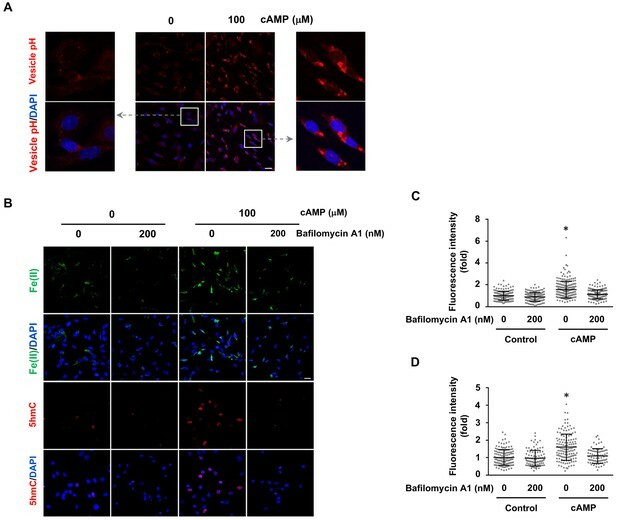 Cells were pretreated with V-ATPase inhibitor Bafilomycin A1 (200 nM). Indeed, Bafilomycin A1 largely abolished the effect of cAMP on labile Fe(II) as well as 5hmC in the cells (Figure 4B–D). Furthermore, knocking down the expression of ferritin did not block the induction of labile Fe(II) elevation by cAMP indicating that iron storage may not be a major target of cAMP signaling (Figure 4—figure supplement 1). 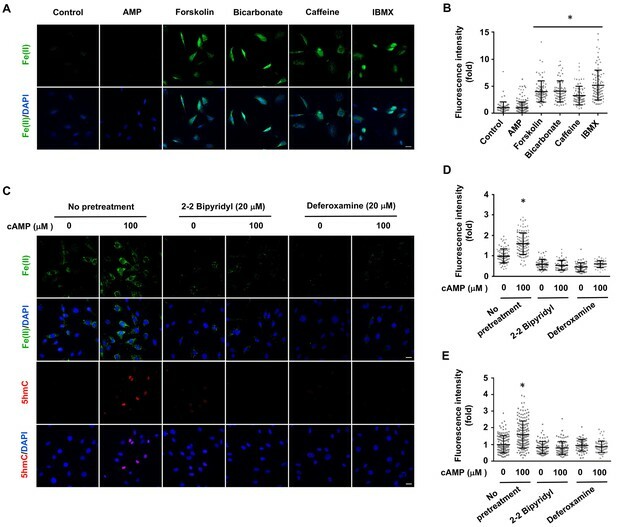 Overall, these results suggest that cAMP signaling upregulates the LIP, and subsequently 5hmC generation by acidifying the endosome. In an attempt to understand how cAMP signaling causes endosome acidification, we examined the major known targets of cAMP, which include PKA, CNGCs, and Epac. PKA phosphorylates substrate proteins and Epac acts as a guanine nucleotide exchange factor for the small G protein Rap. CNGCs are nonselective cation channels for Na+, Ca++, and other cations, but have no known role in transporting iron. To determine whether labile Fe(II) depends on the major known signaling targets of cAMP, we pretreated the cells with PKA inhibitors (KT5720, H89), an Epac inhibitor (ESI09) or a CNGC channel blocker (LCD). Neither the inhibitors nor the channel blocker prevented the observable alterations in labile Fe(II) in cAMP-treated Schwann cells (Figure 5A). Using an in vitro assay, we confirmed that H89 (20 μM) and KT5720 (2 μM) indeed abolished the cAMP-induced phosphorylation of Peptag peptide which is catalyzed by PKA, thus confirming the potency of the two PKA inhibitors (Figure 5—figure supplement 1). Furthermore, the transcripts of CNGC and Epac (RapGEF3, RapGEF4) were expressed at either null or extremely low levels in control and cAMP-treated Schwann cells (Figure 5—source data 1), suggesting that the impact of CNGC and Epac on intracellular labile Fe(II) is likely to be negligible. These results suggest that the upregulation of intracellular labile Fe(II) by cAMP is likely independent of these known pathways. The regulation of labile Fe(II) by cAMP is likely mediated via RapGEF2. (A) Pretreatment with PKA inhibitors (KT5720 (2 μM), H89 (20 μM)), Epac inhibitor ESI09 (10 μM) or CNGC blocker LCD (10 μM) for 20 min prior to cAMP addition showed no effect on labile Fe(II) induced by cAMP (100 μM) treatment in Schwann cells detected by Trx-Puro probes. (B) Knocking down the expression of RapGEF2 in HEK-293 cells largely blocked the acidification of vesicles and labile Fe(II) elevation after cAMP (100 μM) treatment compared to the scramble siRNA group. (C) IF quantification indicates that knocking down RapGEF2 inhibits but does not completely abolish vesicle acidification induced by cAMP. (D) IF quantification indicates that knocking down RapGEF2 inhibits but does not completely abolish labile Fe(II) induced by cAMP. Scale bar = 20 μm. p<0.0005 (n = 3 independent experiments with three biological replicates in each group). Although the transcription of Epac1 (RapGEF3) and Epac2 (RapGEF4) is very low, other RapGEFs, especially RapGEF2 transcripts are expressed at a much higher level (>330 fold of Epac1 or Epac2) in Schwann cells. RapGEF2 appears to be also a target of cAMP, which could be further involved in the activation of other small GTPases (Pak et al., 2002). To explore whether RapGEF2 mediates the elevation of labile Fe(II) via endosome acidification, we used siRNA to knockdown its expression. Due to the low transfection efficiency of primary cultured Schwann cells, we alternatively used HEK-293 cells, which also showed a robust elevation of labile Fe(II) and 5hmC in response to cAMP treatment. In scramble siRNA treated cells, cAMP treatment decreased the pH value in endocytic vesicles and elevated the intracellular labile Fe(II). However, after the expression of RapGEF2 was reduced by siRNA, the effect of cAMP on endosome acidification and labile Fe(II) was largely abolished (Figure 5B–D). The knockdown effect of siRNA on RapGEF2 was confirmed by qRT-PCR (Figure 5—figure supplement 2). Rap proteins are the major effectors of RapGEF2. To test whether Rap is involved in labile Fe(II) induction by cAMP, we knocked down Rap isoforms by siRNA. Knocking down the expression of Rap1, but not Rap2, largely abolished the vesicle acidification of vesicles and labile Fe(II) elevation induced cAMP (Figure 5—figure supplement 3). These results suggest that RAP1 could be one of the downstream effectors of RapGEF2 mediating the signal that elevates intracellular labile Fe(II) in response to cAMP. Overall, these results suggest that cAMP signaling, via RapGEF2 and Rap1, acidifies the endosome to augment the LIP. Signaling of many GPCRs either up- or downregulates intracellular cAMP, depending on the coupled Gs or Gi. It was shown that isoproterenol and calcitonin gene-related peptide (CGRP) elevate cAMP in Schwann cells by binding to β-adrenergic receptors and CGRP receptors respectively (Cheng et al., 1995), both of which are coupled with Gs. We therefore used these two GPCRs as models to test whether their signaling can change DNA hydroxymethylation. Indeed, stimulation with isoproterenol or CGRP increased 5hmC in Schwann cells (Figure 6A and B), which correlated with an elevated level of intracellular labile Fe(II) (Figure 6C and D). 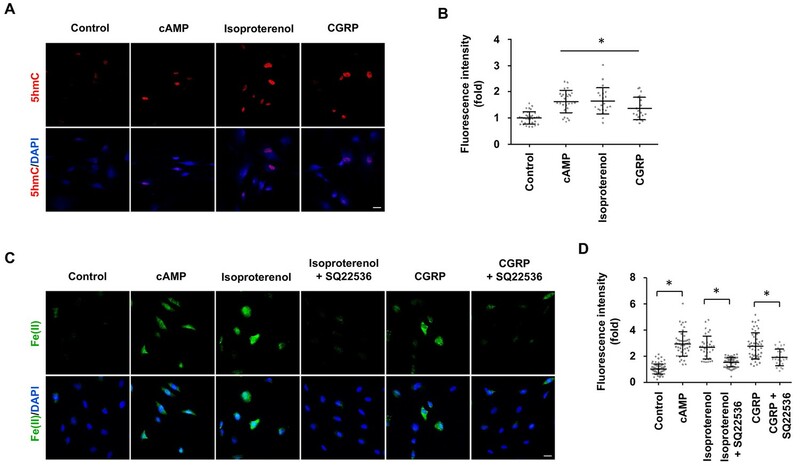 Furthermore, AC inhibitor SQ22536 largely abolished the effect of isoproterenol and CGRP on labile Fe(II) (Figure 6C and D). Overall, these results suggest that GPCR signaling might regulate DNA hydroxymethylation by augmenting the intracellular Fe(II) pool via activated ACs and elevated cAMP. GPCR stimulation induces labile Fe(II) and 5hmC generation in Schwann cells. (A) Treatment with Gs-coupled receptor ligands isoproterenol (10 μM) and CGRP (100 nM) for 2 days induced 5hmC, an effect comparable to treatment with cAMP (100 μM) as shown by IF. (B) IF quantification indicates that activation of Gs-coupled receptors elevates 5hmC. (C) Treatment with isoproterenol (10 μM) and CGRP (100 nM) for 4 hr enhanced intracellular labile Fe(II) detected by Trx-Puro probes, which is comparable to treatment with cAMP (100 μM). The induction of labile Fe(II) by isoproterenol and CGRP was decreased after pretreatment with SQ22536 (100 μM) for 20 min prior to isoproterenol and CGRP stimulation. Scale bar = 20 μm. (D) IF quantification indicates that SQ22536 inhibits the elevation of labile Fe(II) by Gs-coupled receptor ligands. p<0.0005 (n = 3 independent experiments with three biological replicates in each group). cAMP changes the 5hmC profile in differentially expressed genes. It has been previously shown that cAMP shifts the transcriptome (Montminy, 1997). Indeed, 7020 transcripts were differentially transcribed in Schwann cells in response to elevated cAMP as shown by RNA-seq (Figure 7A and B). Of the differential transcripts, 54% were upregulated and 46% downregulated, which is concordant with the bi-directional transcriptional regulation of 5hmC (Wu et al., 2011). Furthermore, genome-wide 5hmC profiles were also altered by cAMP treatment as revealed by hMeDIP-seq (Figure 7C). In total, 66,963 5hmC peaks were upregulated and 10,026 peaks were downregulated by cAMP treatment. By integrating RNA-seq and hMeDIP-seq, we found that 4071 differential transcripts (58% of total differential transcripts) correlate with altered 5hmC peaks located within promoter regions or gene bodies (Figure 8A). Overall, cAMP increased 5hmC levels mainly in gene bodies globally in these differential transcripts. However, the 5hmC increase was much more dramatic in upregulated genes compared to downregulated genes. Comparatively, there was no obvious change of 5hmC in the promoters of transcriptionally unchanged genes (Figure 8—figure supplement 1). These results suggest that changes in 5hmC, especially in gene bodies, could be responsible for the differential transcription or involved in its regulation. cAMP shifts the transcriptome and hydroxymethylome of Schwann cells. (A) cAMP (100 μM) treatment for 7 days changes genome-wide transcription as shown by the heatmap of the relative abundance of reads for differential transcripts. (B) Venn Diagram of the RNA-seq results from the comparison of Schwann cells treated with or without cAMP (100 μM) for 7 days. The numbers within the circles represent the number of differential transcripts called by DESeq2 (yellow), edgeR (green), and CuffDiff (Blue) respectively. (C) cAMP (100 μM) treatment upregulated 5hmC peaks genome-wide as detected by hMeDIP-seq (n = 1 experiment with three biological replicates). 5hmC profile changes correlate with gene transcription. (A) cAMP (100 μM) upregulated 5hmC at promoter and gene body regions of differential transcripts. (B) 33.8% of differential transcripts were associated with both 5hmC peaks and PKA-dependent transcription factors (TF). 24.2% of differential transcripts were associated with 5hmC peaks only and 22.7% of differential transcripts were associated with TF only. The rest of the differential transcripts (19.3%) were not associated with either 5hmC peaks or TF. (C) cAMP (100 μM) increased transcription and 5hmC, mainly in the gene bodies, of Egr2 and Pmp2 shown by UCSC Genome Browser views of hMeDIP-seq and RNA-seq reads (n = 1 experiment with three biological replicates). Currently, it is thought that PKA-dependent phosphorylation of three transcription factors including cAMP response element-binding protein (CREB), cAMP response element modulator (CREM), and activating transcription factor 1 (ATF1) are responsible for the transcriptional changes caused by cAMP (Sands and Palmer, 2008). However, 3965 transcripts (56.5% of total differential transcripts) might be targeted by the three transcription factors after reviewing ChIP data in ENCODE and ChEA databases (Yip et al., 2012; Lachmann et al., 2010). 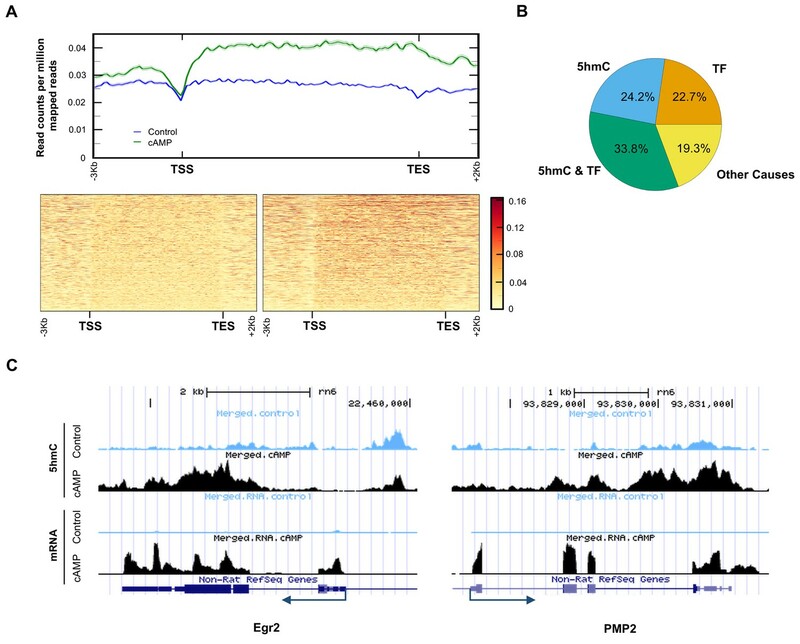 Of the 3965 transcripts, 2372 transcripts were also accompanied with differential 5hmC peaks, suggesting that these genes might be dually regulated by 5hmC and the transcription factors (Figure 8B). Additionally, 24.2% of differentially transcribed genes have differential 5hmC peaks but have not been previously shown to be targeted by CREB, CREM, or ATF1. The transcription of 19 genes with known functions in regulating Schwann cell myelination was affected by cAMP. Overall, 13 pro-myelinating genes were upregulated and six anti-myelinating genes were downregulated by cAMP treatment (Figure 8—source data 1). For example, cAMP dramatically induced the transcription of Egr2 (also known as Krox-20), which plays a key role in Schwann cell myelination (Arthur-Farraj et al., 2011). After cAMP treatment, there was an obvious increase of 5hmC peaks in the gene body of Egr2 (Figure 8C), which is also thought to be targeted by CREB (Hossain et al., 2012). On the other hand Pmp2, which is predominantly expressed in myelinating Schwann cells (Zenker et al., 2014), has no obvious binding motif for the PKA-dependent transcription factors. cAMP treatment elevated the 5hmC level in the gene body and upregulated its transcription dramatically, suggesting this gene could be regulated by 5hmC and not the PKA-dependent transcription factors. It is known that epigenetic changes, such as DNA methylation, reflect the interface of a dynamic extracellular microenvironment and the genome. However, the specific signaling molecules that serve as mediators between environmental variation and epigenomic changes remain largely elusive. On the other hand, GPCRs, the largest and most diverse group of membrane receptors, sense extracellular changes by binding with specific ligands. Signaling of cAMP, one major second messenger of the GPCRs, and its targets has been thoroughly studied and was thought to be well established. Our results show a previously unknown pathway of GPCR-cAMP signaling in promoting the intracellular labile Fe(II) pool, enhancing DNA hydroxymethylation and consequently changing gene transcription. The convergence of 5hmC generation and labile Fe(II) concentrations suggests a previously unrecognized role for labile Fe(II) in propagating a signal initiated by cAMP and mediated by the Fe(II)-dependent oxidase activity of Tet. 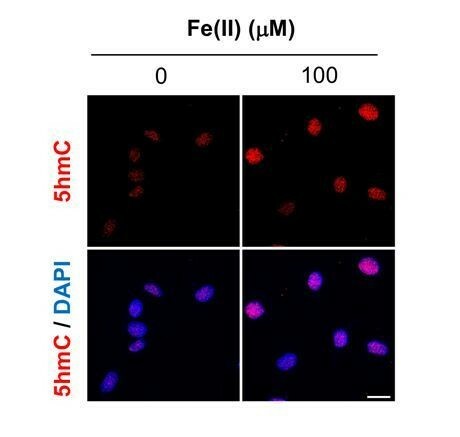 This new role for iron is a plausible one given that cellular iron uptake and the shuttling of iron from storage in ferritin as Fe(III) to its entry into the cytosolic labile pool of Fe(II) is a fundamental aspect of cellular iron metabolism. While this process is clearly involved in maintaining iron homeostasis and the biosynthesis of Fe(II) cofactors, it appears also to have been appropriated for cellular signaling in the particular case of enzymes that employ labile Fe(II) as an essential co-factor, such as the iron and 2OG-dependent Tet and Jumonji C domain-containing histone demethylases. The changes to labile cytosolic Fe(II) measured by Trx-Puro likely also reflect the nuclear Fe(II) pool, since there is a rapid equilibrium between these two Fe(II) pools, presumably via nuclear pores (Ma et al., 2015). Thus, the results described above suggest that cAMP increases the accessibility of Fe(II) to Tet by augmenting labile Fe(II) in the cytosol and nucleus. An increase in labile Fe(II) can be induced by cAMP in as little as 2 hr, indicating that no new protein synthesis is required. The molecular mechanism by which cAMP alters labile Fe(II) appears to be related to iron uptake rather than release from storage in ferritin. Cellular iron uptake is a multistep process including internalization of the transferrin-transferrin receptor complex, vesicle formation, endosome acidification, Fe(III) discharge, conversion of Fe(III) to Fe(II), and release of Fe(II) from the endosome to the LIP. cAMP could potentially be involved in each step of iron uptake. Our results suggest that cAMP signaling increases the acidification of endocytotic vesicles, which is essential for Fe(III) discharge from the internalized transferrin. This is consistent with earlier studies showing that cholera and pertussis toxins, by increasing intracellular cAMP, enhance endosome acidification (Van Dyke, 1997). It could be that cAMP signaling increased the number and/or activity of V-ATPase to pump H+ into the endosome to release Fe(II) to the LIP, which subsequently promotes 5hmC generation. Indeed, we showed that inhibitors of V-ATPase largely abolish the effect of cAMP on labile Fe(II) and 5hmC. The elevation of labile Fe(II) by cAMP signaling appears independent of the major targets of cAMP including PKA, Epac, and CNGC. We examined the effect of RapGEF2 initially based on its higher expression level in Schwann cells. 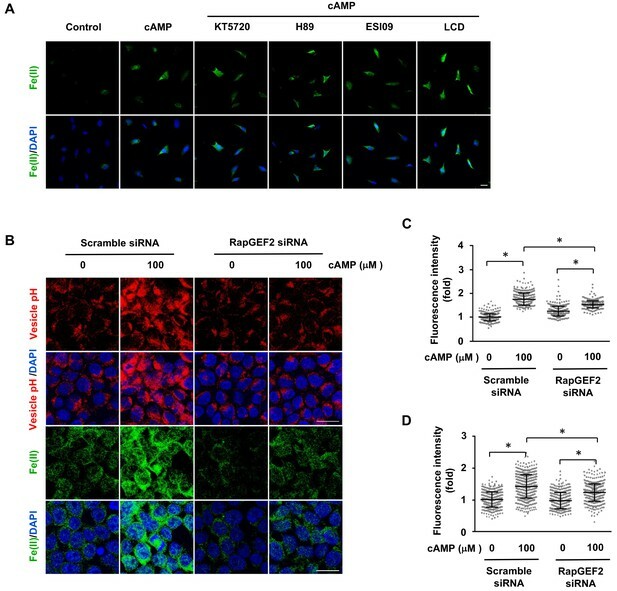 cAMP failed to induce labile Fe(II) and 5hmC once the expression of RapGEF2 or Rap1 was reduced, suggesting that RapGEF2 and its downstream effector Rap1 could be at least major mediators of cAMP to regulate labile Fe(II) and 5hmC. Thus, it is plausible that RapGEF2, directly or indirectly, affects the number and/or activity of V-ATPase in the endosome. Future studies are warranted to investigate how RapGEF2 and Rap1 regulate the function of V-ATPase. Both cAMP and ascorbate appear to enhance the activity of Tet to generate 5hmC. However, the mechanisms of cAMP and ascorbate in promoting the availability of Fe(II) to Tet are likely different. Ascorbate at physiological concentrations has no obvious influence on intracellular labile Fe(II) shown here and before (Spangler et al., 2016), but is thought to maintain local iron in the active form of Fe(II) for Tet as it does for other hydroxylases (Mandl et al., 2009). In contrast, cAMP elevates the global intracellular labile Fe(II) pool. For the first time, GPCRs via cAMP are directly linked to epigenetic regulation. The first hint of a possible role for cAMP in DNA hydroxymethylation came from studies on Schwann cells. Using Schwann cells as a model, we showed that intracellular cAMP elevation increased the intracellular labile Fe(II) pool, changed genome-wide 5hmC profile, and altered the transcription of many genes. More importantly, activation of different Gs-coupled receptors demonstrated increases in intracellular labile Fe(II) and 5hmC similarly to treatments that elevate intracellular cAMP including membrane permeable cAMP, AC activators, or PDE inhibitors. Coupled with Gs, Gi, or both, GPCRs can raise or decrease the intracellular cAMP, which will further change DNA methylation-demethylation dynamics. Thus GPCRs, via cAMP, transduce microenvironmental cues to epigenetic alterations. One recent study showed that cAMP has an impact on DNA methylation by mainly increasing the expression of Tet or DNA methyltransferases (Fang et al., 2015). This may not be a general effect but more likely a cell-specific effect since we observed a decreased expression of Tet2 and Tet3 in Schwann cells after cAMP treatment. In this study, most experiments were conducted in Schwann cells. However, the effect of cAMP on 5hmC is not limited to Schwann cells and is likely a general effect, as it has been verified in other cell types. Studies have shown that 5hmC is not only a demethylation intermediate but also a unique epigenetic mark that regulates transcription by recruiting a different set of binding proteins compared to 5mC (Spruijt et al., 2013). Indeed, altered 5hmC profiles caused by cAMP correlated with a majority of differentially transcribed genes. Thus, cAMP regulates the transcriptome by enhancing DNA demethylation, in addition to the known pathway of PKA-targeted transcription factors. In silico analysis suggests that some differential transcripts correlate with either 5hmC or the three transcription factors, while other transcripts correlate with both or none of them. The focus of this study is to connect the dots from GPCR agonists to cAMP, elevated Fe(II), 5hmC formation, and ultimately transcriptional effects. Future studies can dissect the impact of cAMP on the transcriptome and the contribution of 5hmC and/or the three transcription factors in different cell types. In conclusion, our results show a novel function of cAMP signaling in regulating DNA hydroxymethylation by increasing the intracellular labile Fe(II) pool likely via a non-canonical pathway, which consequently promotes the oxidation of 5mC to 5hmC by Fe(II)-dependent Tet. Dynamic intracellular cAMP, regulated by Gs-/Gi-coupled receptors and factors affecting AC/PDE directly, therefore could have a profound impact on the epigenome. cAMP [8-(4-Chlorophenylthio) adenosine-3',5'-cyclic monophosphate] and AMP (8- Bromoadenosine-5-O-monophosphate) were purchased from Biolog (US distributor, Axxora LLC, San Diego, CA). Recombinant heregulin-β1 (herein referred to as neuregulin) was purchased from Peprotech (Rocky Hill, NJ). Forskolin, poly-l-lysine, bicarbonate, sodium ascorbate, bafilomycin A1, 2,2’-bipyridyl, deferoxamine and laminin from Engelbreth-Holm-Swarm murine sarcoma basement membrane were purchased from Sigma-Aldrich (St. Louis, MO). Caffeine was bought from Enzo Life Sciences (Farmingdale, NY). SQ 22536, IBMX, ESI-09, CGRP (calcitonin gene-related peptide (rat)) and isoproterenol hydrochloride were purchased from Tocris Bioscience (Bristol, UK). KT5720 and H-89 Dihydrochloride were purchased from Millipore (Billerica, MA). LCD (L-cis-Diltiazem) was purchased from Abcam (Cambridge, UK). Dulbecco’s modified eagles’s medium (DMEM) that contain reduced level of sodium bicarbonate (1.5 g/L) (cat#30–2002) was purchased from American Type Culture Collection (ATCC) (Manassas, VA). Primary cultured Schwann cells were isolated from the sciatic nerves of 3 month-old Fisher rats as described previously (Bacallao and Monje, 2015). Briefly, sciatic nerves were cut into small segments and allowed to degenerate in vitro by incubation for 10 days in DMEM medium containing 10% heat inactivated FBS. Degenerated nerve explants were dissociated with a mixture of 0.25% dispase and 0.05% collagenase and the resulting cell suspension was plated on poly-L-lysine (PLL)-coated dishes. The purified Schwann cells were expanded up to passage one in DMEM supplemented with 2 μM forskolin and 10 nM neuregulin. Experiments were performed on Schwann cells between 3 to 5 rounds of expansion plated on PLL-laminin coated glasses in 24-well dishes. The media used were DMEM supplemented with 10% FBS and without forskolin and neuregulin. Treatment of Schwann cells with cAMP was carried out as reported previously (Bacallao and Monje, 2015). HEK-293, A2058, and SH-SY5Y cell lines were obtained from ATCC (Manassas, VA). Mouse embryonic fibroblasts were a gift from Dr. Katherine Walz from the University of Miami. All these cells were cultured in DMEM containing 10% heat-inactivated FBS. Each treatment group contains three wells and major experiments were replicated at least three times. Genomic DNA was extracted from cultured Schwann cells using QIAamp DNA mini kits (Qiagen, Hilden, Germany). A Qubit Fluorometer (Life Technologies, Carlsbad, CA) was used to quantify the concentration of DNA. DNA samples were diluted with 2N NaOH and 10 mM Tris·Cl, pH 8.5, then loaded on a Hybond N + nylon membrane (GE Healthcare, Little Chalfont, UK) using a 96-well dot-blot apparatus (Bio-Rad Laboratories, Hercules, CA). After hybridizing at 80°C for 30 min and blocking with 5% non-fat milk for 1 hr at room temperature, the membrane was incubated in polyclonal anti-5hmC antibody (Active Motif #39769, 1:10,000, Carlsbad, CA) at 4°C overnight. 5hmC was visualized by chemiluminescence. The densities of the dots on membrane were captured and quantified by ImageJ. To ensure equal loading, the membrane was stained with methylene blue post-immunoblotting. Statistical significance of differences in 5hmC content between treatments was assessed by Student t test, at α = 0.05. Cells were seeded in 24-well plates with coverslips at 10,000–50,000 cells per well. After treatments, cells were fixed with 4% paraformaldehyde and then incubated with 2N HCl at 37°C for 20 min and neutralized with 100 μM Tris-HCl for 10 min. After washing with PBS and blocking with 0.4% Triton X-100 with 10% FBS in PBS for 1 hr, cells were incubated with anti-5-hmC antibody (Active Motif #39769, 1:1,000) at 4°C overnight. Alexa Fluor 488-conjugated donkey anti-rabbit IgG (1:500) was used as an immunofluorescent secondary antibody. Cells were then counterstained with DAPI. Labile Fe(II) was detected using the reported methods (Spangler et al., 2016) and Aron et al., 2016). In the first method, cells were treated with puromycin conjugates TRX-Puro, Diox-Puro (a dioxolane conjugate as non-peroxidic control), or puromycin (1 μM) for 2 hr (Spangler et al., 2016). After washing with PBS, cells were fixed in 4% paraformaldehyde for 15 min at room temperature. Cells were then permeabilized with 0.4%Triton X-100 with 10% FBS and 0.25% fish skin gelatin in PBS for 30 min. Cells were incubated with anti-puromycin antibody (1:500) (Kerafast, Boston, MA) overnight at 4°C. After washing, cells were incubated with anti-mouse Alexa Fluor 488 secondary antibody (1:500) for 1 hr. Cells were then counterstained with DAPI. Labile Fe(II) was also measured by FIP-1 probe as described (Aron et al., 2016). Briefly, cells were treated with or without 8-CPT-cAMP (10, 100 μM) for 4 hr. After wash, 10 μM FIP-1 in HBSS was added for 90 min incubation followed with HBSS (containing calcium and magnesium) wash. Cells were maintained in HBSS at 37°C during acquiring images using a Zeiss laser confocal microscope 710. FIP-1 was excited using a 488 nm laser (‘Green’ channel and ‘FRET’ channel). ‘Green’ emission was collected using a META detector between 500 and 535 nm, ‘FRET’ emission was collected using a META detector between 555 and 611 nm. Differential interference contrast (DIC) Image was also collected. Analysis and quantification was performed using ImageJ. Statistical analyses for multiple comparisons were carried out through one-way ANOVA with the Bonferroni correction using the software R.
The acidification of endocytotic vesicles was measured by pHrodo Red Dextran (Thermo Scientific, Waltham, MA) according to the manufacturer’s instructions. Briefly, after plating and cAMP treatments, cells were washed three times with PBS and incubated with pHrodo Red Dextran at a final concentration of 20 μg/ml for 20 min in the incubator. Cells were then washed again with PBS and fixed with 4% PFA for 10 min. After fixation, cells were counterstained with Hoechst 33342. Images were captured by a Zeiss LSM 710 confocal microscopy. To confirm the activity of PKA inhibitors, a non-radioactive PepTag PKA assay (Promega, Madison, WI) was used to measure PKA activity. A2058 cells were plated at 10 cm dishes and and Schwann cell plated in 24 well plates, which were incubated with or without PKA inhibitors (H-89 and KT5720) for 30 min. After treatment with cAMP (100 μM) for 30 min at 37°C, cells were harvested for lysates and for intracellular labile (FeII) detection. The lysate was incubated with the PepTag peptide (Leu-Arg-Arg-Ala-Ser-Leu-Gly), which is a substrate of PKA for phosphorylation. The phosphorylated peptides have a negative charge that was then separated from the non-phosphorylated peptide by agarose gel electrophoresis. The bands were excised and the phosphorylated peptide was quantified by reading the absorbance at 570 nm using a Synergy 2 Biotek spectrophotometer. Small short interfering RNA (siRNA) was used to transiently silence Ferritin heavy chain 1 (FTH1) and RAPGEF2. To decrease the expression of Ferritin, a pool of three siRNA duplexes (cat# SR301663, Origene Technologies, Rockville, MD) against FTH1 and scramble siRNA (cat# SR30004) were used. To reduce the expression of RapGEF2, a pool of four siRNA duplexes (cat# L-009742-00-0005, Dharmacon, Lafayette, CO) was applied. siRNA were delivered to cells by SiTran Transfection reagent (Origene Technologies). After transfection for 72 hr, cells were treated with cAMP for intracellular labile Fe(II) measurement. Cells in a subset of wells were harvested for RNA and protein extraction and subsequent qRT-PCR and immunoblot assays. Cells were washed twice with PBS and then lysed with RIPA buffer (50 mM Tris-HCl, 150 mM NaCl, 0.1% SDS, 0.5% sodium deoxycholate, 1% NP40) in the presence of protease and phosphatase inhibitors. Prior to SDS-PAGE, cell lysates were re-suspended in SDS sample buffer (60 mM Tris–HCl, 1% SDS, 10% glycerol, 0.05% bromophenol blue, pH 6.8, with 2% β-mercaptoethanol). Samples were subjected to 10% SDS-PAGE (Bio-Rad, Hercules, CA) and transferred to PVDF membranes (Bio-Rad) for immunoblot. Transfer efficiency was determined by Ponceau S staining (Sigma-Aldrich, St. Louis, MO). PVDF membranes were incubated with blocking solution (TBS containing 0.1% Tween 20% and 5% BSA) and were probed with specific antibodies including anti-Ferritin heavy chain (B-12) (sc-376594, Santa Cruz Biotechnology, Dallas, TX) and anti-β-Actin (13E5) (cat# 4970, Cell Signaling Technology, Danvers, MA). Protein bands were detected using a chemiluminescence kit (Millipore, Billerica, MA). Cell fluorescence images were acquired into a 512 × 512 frame size by averaging 16 times at a bit depth of 8 using a Zeiss LSM 710 confocal microscope (Oberkochen, Germany). Fluorescence intensity was quantified using Fiji (ImageJ) (Schindelin et al., 2012). Average intensity values were measured from every cell within the image field from a minimum of five 20 × images per condition (Around 450 cells per condition). The intensity values from individual cells were plotted and statistically analyzed by one-way ANOVA with Tukey post hoc test using GraphPad Prism seven from GraphPad Software (La Jolla, CA). RNA was extracted from cultured Schwann cells using RNeasy kits from Qiagen (Hilden, Germany). A nanodrop 8000 photospectrometer (Thermo Scientific, Waltham, MA) was used to quantify RNA. The qScript Flex cDNA kit from Quanta Biosciences (Beverly, MA) was used for reverse transcription (RT) according to the manufacturer’s instructions. Quantitative real-time RT-PCR (qRT-PCR) was performed in triplicate on a QuantStudio 12K Flex using the PowerUp Sybr Green Master Mix from Life Technologies (Carlsbad, CA). Primers were designed to span introns (Figure 1—source data 1). The transcript amplification results were analyzed with the QuantStudio 12K Flex software, and all values were normalized to the levels of Sdha using the 2-(ΔΔCt) method. Statistical significance of differences in expression levels was assessed by Student t test, atα=0.05. Total RNA was extracted from cells using the RNEasy Mini Kit from Qiagen (Hilden, Germany). A Bioanalyzer 2000 was used to measure the quality of RNA. All samples’ RNA integrity numbers (RIN) were above 9. Whole transcriptome sequencing (also known as RNA-seq) was carried out at the Sequencing Core of John P. Hussman Institute of Human Genomics at the University of Miami using the TruSeq Stranded Total RNA Library Prep Kit from Illumina (San Diego, CA). RNA-seq was performed with three replicates per group to give ~89% power to detect a 1.5-fold change between and a standard deviation of 14.5% of the mean. This standard deviation was calculated from actual data used for analysis. Briefly, after ribosomal RNA (rRNA) was depleted, sequencing libraries were ligated with standard Illumina adaptors and subsequently sequenced on a Hiseq2000 sequencing system (125 bp paired-end reads, four samples per lane; Illumina, San Diego, CA, USA). All samples after sequencing had between 39,094,152 and 54,392,564 reads. Raw read data was first run through quality control metrics using FastQC (http: //www.bioinformatics.babraham.ac.uk/projects/fastqc/). Reads were trimmed with trim_galore (http://www.bioinformatics.babraham.ac.uk/projects/trim_galore/) to remove low-quality bases from reads (scores < 20 in Phred + 33 format) and Illumina adapters. After quality control was checked and trimming performed, sequence reads were aligned to the rat transcriptome (Rnor_6.0, Ensembl.org) and quantified using the STAR aligner (Dobin et al., 2013), and normalized using CuffQuant and CuffNorm, which are part of the Tuxedo Suite (Trapnell et al., 2012). All samples had between 37,714,718 and 52,162,956 aligned reads. Statistical significance was determined using three alternative differential expression calculators: edgeR, DESeq2, and CuffDiff (Robinson et al., 2010; Love et al., 2014; Trapnell et al., 2012). To reduce false positives, differentially expressed features were determined by cutoff adjusted P values below 0.05 across all three methods (false discovery rate, FDR). DESeq2 called 8589 differential transcripts, edgeR called 8029 differential transcripts, and CuffDiff called 8076 differential transcripts with a total of 7020 transcripts called as differential by all three programs. Of the 7020 transcripts, 3809 transcripts increase in expression and 3211 transcripts decrease after treatment with cAMP. Differential transcripts were visualized using z-scores per transcript where blue represents lower expression and red represents higher expression in the form of a heatmap generated using the heatmap.2 function of gplots (https://cran.r-project.org/web/packages/gplots/index.html). Genomic DNA was extracted from Schwann cells using QIAamp DNA mini kits from Qiagen (Hilden, Germany) according to the manufacturer’s instructions. A Qubit Fluorometer from Life Technologies (Carlsbad, CA, USA) was used to quantify the concentration of DNA. A Bioanalyzer 2000 was used to measure the quality of DNA. DNA was submitted for hydroxymethylated DNA immunoprecipitation sequencing (hMeDIP-seq) at the Epigenomics Core at the University of Michigan (Mohn et al., 2009). hMeDIP-seq was performed with three replicates per group to give ~98% power to detect a 2-fold change between groups and a standard deviation of 19% of the mean. This standard deviation was calculated from actual data used for analysis. Briefly, DNA is sonicated to approximately 100 bp and then ligated with Illumina adaptors. A portion of the DNA was set aside for sequencing as unprecipitated input DNA and the remaining DNA was incubated overnight at 4 ˚C with an antibody against 5hmC from Active Motif (Carlsbad, CA). The antibodies, along with immunoprecipitated DNA, were then pulled out of solution using Protein G magnetic beads from Invitrogen, (Carlsbad, CA). Magnetic beads were then washed with immunoprecipitation buffer (10 mM sodium phosphate pH 7.0 with 140 mM NaCl and 0.05% triton x-100). The beads were then resuspended in proteinase K buffer and incubated for 3 hr at 55 ˚C to remove the antibodies from the DNA. Unprecipitated input DNA was incubated with proteinase K buffer alongside the precipitated DNA. After proteinase K treatment, DNA was purified using AMPure beads from Beckman Coulter (Brea, California). Efficiency of immunoprecipitation was evaluated using the 5hmC, 5mC, cytosine DNA standard pack from Diagenode (Searing, Belgium). DNA was then sequenced on a HiSeq4000 sequencing system (50 bp single-end reads, three samples per lane; Illumina, San Diego, CA). Immunoprecipitated samples all had between 123,192,512 and 143,992,231 reads and unprecipitated input samples all had between 84,030,758 and 142,427,775 reads. Reads were trimmed with trim_galore to remove low quality bases from reads (scores < 20 in Phred + 33 format), and Illumina adapters. After quality control was checked sequence reads were aligned to the rat genome (Rnor_6.0, Ensembl.org) using BWA (Li and Durbin, 2009). All immunoprecipitated samples had between 117,762,176 and 137,740,430 aligned reads and unprecipitated input samples had between 80,822,191 and 138,629,799 aligned reads. Multimapped reads were removed using Samtools (Li et al., 2009b) and duplicate reads were removed using PicardTools (https://broadinstitute.github.io/picard/). All precipitated samples had between 63,471,316 and 78,618,595 uniquely aligned reads and all unprecipitated input samples had between 44,195,649 and 80,394,782. To identify regions of the genome with substantial levels of 5hmC, peaks were called and filtered using the Irreproducible Discovery Rate (IDR) method developed for the ChIP-seq portion of the ENCODE project (Li et al., 2011). Briefly, peak calling was performed with MACS2 using the narrow peak mode and a relaxed threshold of 0.001 (Zhang et al., 2008). The number of peaks called for the control samples were 364,776, 346,424, and 331,841. The number of peaks called for the cAMP samples were 367,389, 356,223, and 351,249. Peaks were ranked from strongest to weakest peaks in each individual sample, and the rank order of common peaks among samples was compared to filter for only peaks with similar strength across all samples using the R-scripts provided for the IDR pipeline with a threshold of 0.02. After filtering for peaks in common, 106,807 peaks remained for the cAMP samples and 120,057 peaks remained for the control samples. The lower number of filtered peaks among the cAMP samples is likely a result of treatment causing higher variability in 5hmC levels in samples. When peaks across sample types were merged, a total of 192,143 peaks remained to be investigated in all samples. Reads within peak regions were quantified using HT-Seq-count (Anders et al., 2015). Statistical significance was determined using edgeR as was used for RNA-seq, except without using the calcNormFactors function so as to normalize to total read counts rather than counts within peaks. This normalization was necessary to account for a global change in 5hmC levels. Differential expression was also calculated using DESeq2. To minimize false positives, we considered only peaks with a minimum of 2X fold change and below an adjusted P-value (false discovery rate, FDR) below 0.05 by both edgeR and DESeq2. By this method, 66,963 peaks were upregulated, and 10,026 peaks were downregulated after treatment with cAMP, and 115,154 peaks remained unchanged. For each individual sample, coverage at each base in the genome was calculated and normalized to total read count using bedtools genomecov (http://bedtools.readthedocs.io/en/latest/content/tools/genomecov.html). Coverage files were converted to bigwig files using the wigToBigWig program from UCSC genome browser (http://hgdownload.cse.ucsc.edu/admin/exe/linux.x86_64.v287/). Read density for peaks in each sample was visualized using version 2 of DeepTools (Ramírez et al., 2016) and individual bigwig files. Visualization of read density across differential genes was also performed using DeepTools and the merged bigwig files. 5hmC peaks were assigned to regions of the genome using Region_analysis in the diffReps package (Shen et al., 2013). Peaks whose center was within 3,000 bp of the transcription start site (TSS) of a given gene were considered promoter regions for that gene, and peaks whose center lay in the remainder of the gene or up to 1,000 bp following the transcription end site (TES) were considered gene body for that gene. Peaks outside of gene body regions and gene promoter regions were classified as intergenic. Differential transcripts, with differential peaks assigned to either the promoter region or gene body of that gene, were considered to be potentially regulated by 5hmC. Of the 7020 differential transcripts, 4071 (58%) were found to be potentially regulated by 5hmC. Further, visualization of both RNA-seq and hMeDIP-seq data was done using UCSC genome browser (https://genome.ucsc.edu/) and bigwig files showing loci of differential transcripts. It is known that elevation of cAMP regulates the activity of three different transcription factors: CREB1, CREM and ATF1. The Ma’ayan laboratory has posted analyzed data online from both the ChEA and ENCODE projects (http://amp.pharm.mssm.edu/X2K/#downloads). To find genes potentially regulated by these three transcription factors, we used the ENCODE 2015 and ChEA 2015 databases (Yip et al., 2012; Lachmann et al., 2010). Experiments using rat cells are uncommon in these databases, so we combined the lists of genes found regulated by all experiments of a given transcription factor from human, mouse, or rat experiments. ATF1 was found to regulate 2000 genes across a variety of human cells in the ENCODE projects, of which 1996 genes were found to have a rat homolog in the Jackson Labs Complete Homology Class report (http://www.informatics.jax.org/homology.shtml). CREM was found to regulate 5776 genes in mouse testicular cells (GC1-SPG) in the ChEA project, of which 5773 were found to have a rat homolog in the Jackson Labs Complete Homology Class report. CREB1 was found to regulate 4040 genes across human leukemia (K562) and adenocarcinoma (A549) cells in the ENCODE project, as well as 957 genes in human embryonic kidney (HEK-293) cells in the ChEA project. CREB1 was also found to regulate 2393 genes in rat hippocampus and 3057 genes in mouse testicular cells (GC1-SPG) in the ChEA project. Combining data from all CREB1 experiments in both ChEA and ENCODE gave 6997 rat genes potentially regulated by CREB1. Combining results from all experiments of all three transcription factors, 9767 genes have been found to potentially be regulated by at least one of these three transcription factors. Of the 7020 differential transcripts, 3965 (56.5%) were included in the list of genes potentially regulated by one of the three transcription factors that is activated by cAMP/PKA. Differences in transcription can be possibly attributed to both transcription factors and changes in 5hmC for 2372 (33.8%) of the 7020 transcripts and 1356 (19.3%) are not likely regulated by either transcription factor or 5hmC. Journal of the American Chemical Society 138:14338–14346. Annual Review of Neuroscience 9:305–328. The Journal of Cell Biology 129:789–796. Nature Reviews Molecular Cell Biology 9:72–81. Biochemical and Biophysical Research Communications 439:522–527. American Journal of Physiology - Cell Physiology 309:C425–C436. Annals of the New York Academy of Sciences 633:78–89. British Journal of Pharmacology 157:1097–1110. Journal of Biological Chemistry 288:13669–13674. Methods in Molecular Biology 507:55–64. Annual Review of Biochemistry 66:807–822. Molecular and Cellular Biology 22:7942–7952. Nature Reviews Molecular Cell Biology 14:341–356. Annual Review of Biochemistry 83:585–614. JAMA: The Journal of the American Medical Association 214:1281–1288. The American journal of physiology 272:C1123–1133. Journal of the American Chemical Society 135:10396–10403. Thank you for submitting your article "cAMP Signaling Regulates DNA Demethylation by Augmenting the Intracellular Labile Ferrous Iron Pool" for consideration by eLife. Your article has been reviewed by three peer reviewers, and the evaluation has been overseen by a Reviewing Editor and Kevin Struhl as the Senior Editor. One of the reviewers, Yehia Daaka, has agreed to reveal his identity. In this paper, Camarena et al. examine the contribution of extracellular cues to the regulation of epigenetic modifications, focusing on GPCR-based regulation of the Tet DNA demethylase. The authors delineate a mechanism by which GPCR signaling via cAMP induces endosome acidification, leading to the release of iron, which serves as a cofactor for Tet enzymes. This pathway operates independently of classical cAMP effectors, but requires RapGEF2 for endosome acidification. This work highlights an unappreciated role for GPCR signaling in regulating DNA methylation and gene expression. The reviewers generally agree that this work is likely to be of significant interest to the community. Because of the potential of this work to be paradigm-shifting in the cAMP and DNA methylation fields, it is important that the authors further solidify their conclusions. The reviewers raised some major concerns which should be successfully addressed before the manuscript can be considered for publication. 1) The authors have not adequately entertained alternative hypotheses, nor tested all assumptions regarding their own model. Specifically, the reviewers suggested that GPCR signaling might affect nuclear import of iron, and/ or processing of 5hmC to 5-formylcytosine or 5-carboxycytosine. Furthermore, the authors have not demonstrated that free iron (and endosome acidification) are limiting for Tet activity. The alternative hypotheses should be ruled out, and the idea that endosome acidification and iron availability are limiting demonstrated (reviewer #1 has suggestions on addressing these issues). 2) There are serious concerns from multiple reviewers regarding the dosage and duration of different treatments. Particularly concerning were the experiments done after 7 days of cAMP treatment, as physiological GPCR signaling is rapid and transient, and cells are likely to lose viability after 7 days of treatment. Questions regarding the type of cAMP analog used and its concentration, as well as the effects of the various activators/ inhibitors on cAMP, Fe++, and 5hmC levels at different timepoints, should be fully addressed. 3) Along the same lines, termination of the cAMP response has not been addressed. It would be important to show downregulation of the response by conducting a timecourse of Fe++ and 5hmC levels after forskolin washout. A similar timecourse experiment in the presence of cAMP should be done to show any sensitization effects, which are hinted at in Figure 2C-D.
4) Additional mechanistic insight into RapGEF2 function should be provided. The authors should address whether the endosome acidification and LIP are mediated by Rap, and if so, which isoform. Secondly, the authors should address how RapGEF2 is affected by cAMP, e.g. by checking expression levels and subcellular localization. 5) The sequencing analysis should be done more thoroughly. The data should be collected at 48-72 hrs after cAMP treatment, and compared to the data collected at 7 days. Sequencing should consider methylation of promoters, enhancers, and gene bodies separately. 6) To increase confidence in the results, the authors should use complementary approaches (ideally something other than microscopy-based assays) whenever possible. Reviewer #3 has given suggestions on how to accomplish this. 1) "In healthy cells such as primary cultured Schwann 125 cells, the most plausible rate-limiting factor for Tet's enzymatic activity is the replenishment of the Fe(II) cofactor rather than 2OG, a relatively abundant intermediate of the Krebs cycle." I agree 2OG may not be limiting factor but iron(II) is quite abundant as well. The abundance of nuclear iron(II) has not been adequately studied as iron(II) needs to be transported into nucleus in order to supply TET. This is maybe something the authors should really look into with the cAMP signaling. The authors should really isolate the nuclear fraction and use ICP-MS to study total iron level instead of whole cell. Or at least perform imaging of labile iron within nucleus. The technique I recommend is the synchrotron based X-ray fluorescence metal imaging. The acidification of endosome is a good mechanism but I doubt it is the only one or the one that matters. Under different cellular signaling iron enriches in nucleus. cAMP might influence that pathway, which explains less effect observed with ferritin KD. If simply for the level of cytoplasmic iron level ferritin should have a major role. 2) The studies of 5hmC with gene expression changes are shallow. The authors mixed different effects here. Gene body 5hmC levels should correlate with mRNA level changes. Promoter 5hmC levels could go either way. Another place to really check is enhancer 5hmC level changes. More in depth analysis would help. What is the effect of cAMP accumulation on 5hmC expression at early time points (say 1-24 hrs)? Chemical reagents concentrations used (cAMP and inhibitors) are noticeably high (up to 100 microM); why? Also, in Figure 1 the cAMP concentrations needed for (presumably maximal effects on) MEFs are lower than for other cell types. Any explanation? The authors suggest that RapGEF2 regulates LIP in a mechanism that is dependent upon cAMP. What is the evidence for this conclusion? Also, does RapGEF2 promote activation of Rap? Other small GTPases? If Rap is the effector of RapGEF2, it would be interesting to identify what isoform of Rap is involved in the cAMP-induced LIP, and whether this effect is through endosome acidification? In their study Camarena et al. investigate the role of cAMP in DNA methylation. Using mainly imaging approaches the authors conclude that cAMP enhances the generation of 5-hydroxymethylcytosine (5hmC) (an indicator of DNA methylation/demethylation status) which results in significant changes in the programs of gene transcription of Schwann cells. The authors provide evidence suggesting that the increase in 5hmC levels in response to cAMP elevations may be a generalised event (Schwann; HEK; MEF and SYSH5 cells). The effects of cAMP on 5hmC levels seen independent of the classical cAMP effectors (PKA; EPACs etc.) and the ten-eleven translocation (Tet) proteins. On the contrary, the authors propose that cAMP enhances endosome acidification via RapGEF2 resulting in an increase in the levels of Fe(II) and essential cofactor of the Tet enzymes. This is an interesting and thought provoking article that would be of interest in the readership of eLife. However, at its present state the article presents a major issue: the timing and intensity of the cAMP (or cAMP triggering) treatments used, are not well defined and are far from being physiological, undermining the core hypothesis of the existence of a GPCR-cAMP-RapGEF2 axis. First of all the authors use the cell "permeant" cAMP analog 8-CPT-cAMP in a range from 1µM to 250 µM. Since it is not specified the type of 8-CPT-cAMP used (Na+ salt Vs AM-ester) it is very difficult to understand the levels of the messenger at the cellular level. For instance if they used Na+ salt in concentrations of low µM the cellular levels of 8-CPT cAMP would be too low to activate any effector, on the contrary at 1µM of the AM-ester the levels of cellular 8-CPT-cAMP would reach saturating values making difficult to reconcile the dose response data observed by the authors (Figure 1C, Figure 2B). Secondly in addition to 8-CPT-cAMP the authors use other means to increase cellular cAMP levels. The concentration of FSK (100µM) is far too much (saturating doses go from 10 to 25µM) and the effect observed is basically the same as the treatments with IBMX (100µM) to block PDEs, caffeine to block a subset of PDEs (and release Ca2+ from the stores) and Bicarbonate (50mM) to activate only the soluble adenylyl cyclase that would produce a fraction (if any) of the FSK increases in cellular cAMP. The authors should measure the cellular levels of cAMP reached with these treatments (elisa or FRET-based assays). 2) Timing:cAMP signals are physiologically produced by GPCRs and are meant to be fast and transient. On the contrary here the authors treat their cells with 100µM 8-CPT-cAMP from 1 to 7 days (Figure 1E and F). The max effect on 5hmC levels is reached after 24h (Figure 1F) and is maintained for 7 days. These data are not well matched to the data of Figure 2C and D showing that the levels of Fe(II) peaked after 4h trending to decrease after that (what is the level of Fe(II) after 7days?). This is an important point since the authors for their RNA-seq experiments choose to treat their cells for 7 days with 100µM 8CPT-cAMP. In order to be conceived as a signalling cascade the GPCR-cAMP-RapGEF2 axis should undergo termination as well. This is something that is not suggested by the experiments on Figure 1E and F where the levels of 5hmC remain high for the whole period of the treatment. On the contrary the trent of the Fe(II) levels in Figure 2C and D would suggest a negative feedback. The authors should perform a series of experiments addressing this point. For instance they could treat cells for 2-4 hours with FSK and then follow the levels of 5hmC and Fe(II) for a period of time (up to 24-48 hours) would be suggested. This is also relevant for the data presented in Figure 6 where treatment with extremely high doses of isoproterenol induces Fe(II) and 5hmC increases after 2 days. This is somewhat surprising since β receptors would most likely be internalised and desensitised with prolong treatments with saturating (1-2µM) doses of Isoproterenol. This is a crucial point, as it is not conceivable that once activated this pathway cannot be turned off. Thank you for resubmitting your work entitled "cAMP Signaling Regulates DNA Demethylation by Augmenting the Intracellular Labile Ferrous Iron Pool" for further consideration at eLife. Your revised article has been favorably evaluated by Kevin Struhl (Senior Editor) and a Reviewing Editor. 1) The authors have shown intriguing new results that termination of GPCR signaling does not restore 5hmC levels to their basal state. The authors should solidify this finding by repeating the forskolin washout experiment in HEK293 cells, and assaying 5hmC levels at 72 hours. Based on the outcome of this experiment, the authors should provide a commentary as to the role of GPCR signaling in establishment vs. maintenance of 5hmC in different cell types. 2) In light of the above finding, the title should be made more accurate by referring to "5hmC" rather than "demethylation," as the authors have not demonstrated full removal of the methyl mark in this system. Something like "cAMP signaling regulates DNA 5hmC by augmenting the intracellular labile ferrous iron pool" would more accurately reflect the results. 3) The authors write that the timepoints for sequencing analysis were chosen to allow analysis of the effects of GPCR signaling on myelinating genes. However, they mention only 2 individual genes involved in this process. The authors should use the sequencing data to provide a global analysis of myelinating genes, and any others involved in Schwann cell differentiation. We thank the reviewers for raising this concern. The hydroxylation of 5mC to 5hmC requires the following: the enzyme Tet methylcytosine dioxygenases (expressed in the cell), the substrate 5mC (abundant in the genome), the co-substrate 2OG, the cofactor Fe(II), and oxygen. If the limiting factor is not Fe(II), the alternative hypothesis could be that this chemical reaction is limited by 2OG and oxygen. However, under cell culture conditions, 2OG, which is a relatively abundant intermediate in the Krebs cycle, and oxygen are available to Tet. Despite their abundance, 5hmC was barely detectable in untreated cells (Figure 1), suggesting that the halted hydroxylation catalyzed by Tet is not limited by 2OG or oxygen. We and others have shown that ascorbate promotes the conversion of 5mC to 5hmC (Minor EM et al., JBC2013; Yin R et al., Blaschke K et al., Nature 2013; J Am Chem Soc 2013; Chen J et al., Nat Genet. 2013; Dickson KM et al., BBRC 2013). While 5hmC was nearly undetectable in untreated cells, ascorbate induced a strong increase of 5hmC in Schwann cells (Figure 1A-B). Ascorbate has the capacity of reducing the catalytically inactive Fe(III)/Fe(IV) to Fe(II), which underlies the 5hmC increase, just as it does for collagen hydroxylases. These results suggest that Fe(II) is likely the limiting factor for 5hmC generation. To further test whether Fe(II) is the limiting factor for 5hmC generation, we treated Schwann cells with Fe(II). Schwann cells cultured in media containing Fe(III) showed low basal levels of 5hmC. Addition of Fe(II) to the media induced 5hmC generation in the cells (see Author response image 1). These results suggest that Fe(II) is likely the limiting factor for 5hmC generation. Robust 5hmC signal could be detected after cells were treated with cAMP (Figure 1). The affinity of Tet for Fe(II) (KD) is about 0.41 ± 0.05 μM (Hore TA et al., PNAS 2016). TRX-puro probe detects labile Fe(II) in 0.1 ~ 1 μM range (Spangler et al.,Nat Chem Biol. 2016), which corresponds to intracellular Fe(II) levels (Epsztejn S., et al. Blood1999). Using TRX-puro probe, we have detected obvious increases of labile Fe(II) by cAMP treatment, suggesting that an increase in labile Fe(II) over basal levels could mediate the effect of cAMP on 5hmC by activating Tet activity. Furthermore, this effect of cAMP on 5hmC was largely abolished by treatment with two different iron chelators (Figure 3C-E), suggesting that the promotion of 5hmC by cAMP is dependent on iron. Endosome acidification is one key step for iron uptake. We showed that cAMP increased endosome acidification and that inhibition of V-ATPase diminished the effect of cAMP on labile Fe(II) and 5hmC (Figure 4). Taken together, these data suggest that labile Fe(II) is one key limiting factor for Tet activity. While total iron could be abundant in the cells, labile Fe(II) must be tightly controlled due to its active redox activity, especially its ability to produce free radicals through the Fenton reaction (Dunn LL, et al., Trends Cell Biol. 2007). Currently, measuring labile Fe(II) in the cell still remains an experimental challenge. Even with these difficulties, we managed to show that cAMP elevated the total labile Fe(II) using Trx-Puro probes in the cell. To further confirm these results, we now show an obvious increase of labile Fe(II) in HEK-293 cells after cAMP treatment using another newly developed labile Fe(II) probe FIP-1 (Aron AT, et al., J Am ChemSoc.2016) in collaboration with Christopher Chang (UC Berkeley/HHMI). This new data is now included in Figure 2—figure supplement 3. Little is known how labile Fe(II) enters the nucleus. It is generally accepted that there is a rapid equilibrium between the cytoplasmic labile pool and the nuclear labile Fe(II) pool, presumably via nuclear pores (Ma Y et al., Metallomics 2015), suggesting that cAMP could potentially elevate labile Fe(II) in the nucleus. Following the reviewer’s suggestion, we assessed total iron in the fractionated nuclear and cytoplasm extracts from HEK-293 cells treated with or without cAMP by ICP-MS. This experiment was completed by Christopher Chang’s team. The results indicate that there is no significant change in total cellular iron after treatment with cAMP. It is noteworthy that the labile iron pool is only a very small part (0.2 ~0.3%) of total iron in the cell (Petrat F et al., Biol Chem. 2002). Therefore, it is reasonable that cAMP elevates labile Fe(II) but might not exert a detectable change in the total iron. Labile Fe(II) is a cofactor for Tet methylcytosine dioxygenases, which can further oxidize 5hmC to 5fC and 5caC. Due to the fact that 5fC/5caC are rare in the genome and are relatively difficult to be accurately evaluated, we focused on 5hmC in the study. Because the principle of these Tet-mediated oxidation reactions is similar, it is plausible that cAMP promotes the conversion of 5mC to 5hmC, and further to 5fC and 5caC as well, which will be examined in our future studies. Activation of Gs-coupled receptors elevates intracellular cAMP principally from these three steps: (1) activation of membrane bound AC; (2) Gβγ subunit activation of certain AC isoforms; (3) Continuous production of cAMP by Gs and AC in the endosome after receptor internalization. Thus, intracellular cAMP elevation by activated Gs-coupled receptors persists by compartmentalized signaling. Furthermore, under physiological conditions, the stimuli are often persistent and periodic, which can result in a long-term oscillation of intracellular cAMP (Dyachok O, et al., Nature 2006). It has been shown that the differentiation of Schwann cells to a myelinating phenotype can be induced only by prolonged treatment with cAMP. After differentiation, cells remain viable as shown by specific marker expression (Monje PV et al., Glia. 2009). This correlates with the in vivo evidence that GPR126, via elevation of cAMP, promotes myelination (Monk KR, et al., Science2009). Furthermore, in our initial experiments, Schwann cells had been treated with cAMP for up to 15 days and remained healthy as observed by Incucyte video and images. The cAMP analog used was 8-CPT-cAMP (sodium salt), which is cell permeable and mimics the action of cAMP in the cell as do other cAMP analogues such as 8-CPT-cAMP-AM. We thank the reviewer’s insightful comments about membrane permeability of 8-CPT-cAMP (sodium salt). It is now clear to us that the permeability of 8-CPT-cAMP is only about 22% of what is applied extracellularly (Wener K et al., Naunyn Schmiedebergs Arch Pharmacol. 2011). Even with this less-than-ideal permeability, 1 μM 8-CPT-cAMP still caused an obvious elevation of labile Fe(II). By examining the dose-dependent effect of 8-CPT-cAMP on labile Fe(II) and 5hmC, we showed that 8-CPT-cAMP at 100 μM induced robust increases in both labile Fe(II) and 5hmC. Since 8-CPT-cAMP at 100 μM promotes cultured Schwann cells into a promyelinating phenotype (Monje PV et al., Glia. 2009), we then selected this treatment for high-throughput sequencing. Forskolin treatment was initially carried out at 100 μM because forskolin at 100 μM produces a maximal increase of intracellular cAMP in Schwann cells (Yoshimura T et al., Neurochemical Research 1994). Following the reviewer’s suggestion, we have replicated the effect of forskolin at much lower concentrations (5 and 10 μM) on 5hmC (now included in Figure 1—figure supplement 2) and on labile Fe(II) (now included in Figure 3—figure supplement 1). Bicarbonate was used at 50 μM which was shown to induce a maximal effect on cAMP (Chen Y et al., Science 2000). Caffeine and IBMX concentrations were chosen at 100 μM to inhibit phosphodiesterases based on previous publications (Fredholm BB et al., Pharmacological Reviews 1999). The effect of cAMP was further verified by stimulation of Gs-coupled receptors. We also include new data showing that short term treatment (such as 1 h) and lower concentrations of cAMP (10 μM) and forskolin (5 or 10 μM) elevated 5hmC in the cell (now included in Figure 1—figure supplement 2). These data suggest that the effect of cAMP on Fe(II) is likely rapid and is responsible for activating Tet to produce 5hmC. However, our ability to observe changes in the LIP at very early time points (< 2 h) is limited with TRX-puro. This is because the rate-limiting step in puromycin release is a β-elimination reaction that occurs subsequent to reaction of TRX-puro with Fe(II) (see Spangler et al., Nat Chem Biol. 2016). We believe that the delay in peak Fe(II) signal compared to 5hmC signal is significantly a result of puromycin release kinetics rather than a delayed mobilization of Fe(II). Following the reviewers’ suggestion, we conducted the following experiments. a) HEK-293 cells were treated with cAMP (10 μM) for 1, 4, or 24 h and cells were washed immediately after the completion of treatments. 24 h following washout, 5hmC increases were detectable in all three treatments (now included in Figure 1—figure supplement 2). b) Schwann cells were treated with forskolin (10 μM) for 3 h followed by washout. The results showed that compared to non-treated cells, labile Fe(II) was elevated after treatment for 3 h and then declined to basal levels (now included in Figure 3—figure supplement 1). In contrast, the elevation of 5hmC sustained for 24 h after washing in Schwann cells (now included in Figure 1—figure supplement 2). c) Schwann cells were treated with forskolin (10 μM) for 4, 12, 24 h followed by washout and 5hmC measurement at 72 h following treatment. We found that 5hmC levels with these treatments after washout were comparable to 72 h of continuous treatment (now included in Figure 1—figure supplement 2). Results of these experiments suggest that labile Fe(II) elevation is relatively transient but the increase in 5hmC persists after termination of forskolin or cAMP by washout. We performed additional experiments to look into the mechanistic role of RapGEF2. Rap is the major downstream effector of RapGEF2. We knocked down the expression of Rap isoforms (Rap1 and Rap2). The results showed that silencing Rap1, but not Rap2, largely abolished the effect of cAMP on endosome acidification and labile Fe(II), suggesting that Rap1 is likely one major effector mediating the effect of RapGEF2 on the LIP (Figure 5—figure supplement 3). cAMP has been shown to activate RapGEF2, which in turn activates Rap1 (Emery AC, et al. Sci Signal. 2013). Rap1 presents in the plasma membrane and endosomes. Further investigations are needed to study the detailed role of RAP1 in endosome acidification. The differentiation of Schwann cells into a promyelinating phenotype requires a prolonged treatment with cAMP (Monje PV. Glia 2009). We thus selected cells treated for 7 days for RNA-seq in order to show the impact of cAMP on the transcriptome, but more importantly, on the expression of myelinating genes. Following the reviewers’ helpful suggestion, we further examined 5hmC-enriched regions in the promoters and gene bodies (this new data is now included in Figure 8—figure supplement 1). The results showed that 5hmC increased in the gene bodies globally but the increase was much more dramatic in transcriptionally upregulated genes compared to downregulated or nondifferential genes. There was no obvious change of 5hmC in the promoters of transcriptionally unchanged genes. However, 5hmC increased in the promoters of both upregulated and downregulated genes. Due to the lack of relevant ChIP-seq data (such as H3K4me1, H3K4me3, H3K27ac, and H3K27me3) in Schwann cells, we are unable to determine enhancer regions for analysis. We agree with the reviewers. We used another probe FIP-1 developed in collaborator Christopher Chang lab (UC Berkeley/HHMI) (Aron AT, et al., J Am Chem Soc.2016). Distinct from Trx-Puro probes, this method measures FRET signaling from the probe specifically disrupted by ferrous labile iron. The experiments were performed entirely in the Chang lab and results showed an obvious increase of labile Fe(II) in HEK-293 cells after cAMP treatment using labile Fe(II) (now included in Figure 2—figure supplement 3). Other than these methods, we have not established other sensitive and reliable techniques to accurately quantify the LIP in the cell. 1) […] The acidification of endosome is a good mechanism but I doubt it is the only one or the one that matters. Under different cellular signaling iron enriches in nucleus. cAMP might influence that pathway, which explains less effect observed with ferritin KD. If simply for the level of cytoplasmic iron level ferritin should have a major role. Please see our response to Essential revisions #1. We thank the reviewer for the insightful comments. We further examined 5hmC-enriched regions in the promoters and gene bodies (this new data is now included in Figure 8—figure supplement 1). The results showed that 5hmC increased in the gene bodies globally but the increase was much more dramatic in transcriptionally upregulated genes compared to downregulated or nondifferential genes. There was no obvious change of 5hmC in the promoters of transcriptionally unchanged genes. However, 5hmC increased in the promoters of both upregulated and downregulated genes. Due to the lack of relevant ChIP-seq data (such as H3K4me1, H3K4me3, H3K27ac, and H3K27me3) in Schwann cells, we are unable to determine enhancer regions for analysis. Following the reviewer’s suggestion, we now include new data showing that forskolin (10 μM) treatment for 3 h elevates 5hmC level (now included in Figure 1—figure supplement 2). Furthermore, 5hmC is also increased 24 h after a brief (1 h) cAMP (10 μM) treatment (now included in Figure 1—figure supplement 2). These data suggest that the effect of cAMP could be fast but still needs time for labile Fe(II) elevation, which further activates Tet to generate 5hmC. It is now clear to us that the permeability of 8-CPT-cAMP is only about 22% of what is applied extracellularly (Wener K et al., Naunyn Schmiedebergs Arch Pharmacol. 2011). Even with this less-than-ideal permeability, 1 μM 8-CPT-cAMP still caused an obvious elevation of labile Fe(II). By examining the dose-dependent effect of 8-CPT-cAMP on labile Fe(II) and 5hmC, we showed that 8-CPT-cAMP at 100 μM induced robust increases in both labile Fe(II) and 5hmC. Since 8-CPT-cAMP at 100 μM promotes cultured Schwann cells into a promyelinating phenotype (Monje PV, et al., Glia.2009), we then selected this treatment for high-throughput sequencing. We also include new data showing that short term treatment (such as 1 h) and lower concentrations of cAMP (10 μM) and forskolin (5 or 10 μM) elevated 5hmC in the cell (now included in Figure 1—figure supplement 2). These data suggest that the effect of cAMP on Fe(II) is likely rapid and is responsible for activating Tet to produce 5hmC. We treated different cell types with cAMP at the same concentration (10 μM) to show that the effect of cAMP on 5hmC is not limited to Schwann cells. The difference in 5hmC response to cAMP treatment, to our understanding, could be due to the variations in iron uptake (such as transferrin receptor density), Tet expression levels, and DNA methylation (5mC) levels among these cells. cAMP has been shown to activate RapGEF2, which in turn activates Rap1 (Emery AC, et al., Sci Signal. 2013). We showed that knockdown of RapGEF2 largely abolishes the upregulation of the LIP by cAMP (Figure 5B). In contrast, inhibition of the canonical PKA pathway does not interfere with the elevation of the LIP by cAMP (Figure 5A). These results suggest that RapGEF2 likely mediates the effect of cAMP on the LIP. We performed additional experiments to look into the mechanistic role of RapGEF2. Rap is the major downstream effector of RapGEF2. We therefore knocked down the expression of Rap isoforms (Rap1 and Rap2). 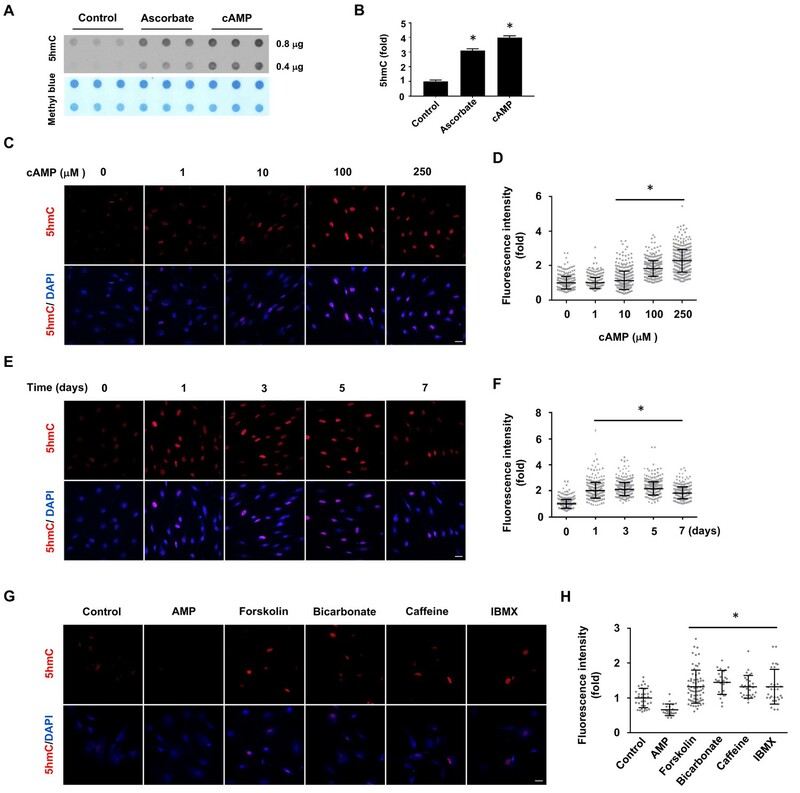 The results showed that silencing Rap1 largely abolished the effect of cAMP on endosome acidification and labile Fe(II), suggesting that Rap1 is likely one major effector mediating the effect of RapGEF2 on the LIP (Figure 5—figure supplement 3). […] This is an interesting and thought provoking article that would be of interest in the readership of eLife. However, at its present state the article presents a major issue: the timing and intensity of the cAMP (or cAMP triggering) treatments used, are not well defined and are far from being physiological, undermining the core hypothesis of the existence of a GPCR-cAMP-RapGEF2 axis. We thank the reviewer insightful comments about the membrane permeability of 8-CPT-cAMP. 8-CPT-cAMP is a cell-permeable sodium salt which mimics the action of cAMP in the cell as do other cAMP analogues such as 8-CPT-cAMP-AM. It is now clear to us that the permeability of 8-CPT-cAMP is only about 22% of what is applied extracellularly (Wener K et al., Naunyn Schmiedebergs ArchPharmacol. 2011). Even with this less-than-ideal permeability, 1 μM 8-CPT-cAMP still caused an obvious elevation of labile Fe(II). By examining the dose-dependent effect of 8-CPT-cAMP on labile Fe(II) and 5hmC, we showed that 8-CPT-cAMP at 100 μM induced robust increases in both labile Fe(II) and 5hmC. Since 8-CPT-cAMP at 100 μM promotes cultured Schwann cells into a promyelinating phenotype (Monje PV, et al., Glia. 2009), we then selected this treatment for high-throughput sequencing. It has been shown that the differentiation of Schwann cells to a myelinating phenotype can be induced only by prolonged treatment with cAMP. After differentiation, cells remain viable as shown by specific marker expression (Monje PV, et al., Glia. 2009). This correlates with the in vivo evidence that GPR126, via elevation of cAMP, promotes myelination (Monk KR, et al., Science2009). Furthermore, in our initial experiments, Schwann cells had been treated with cAMP for up to 15 days and remained largely healthy as observed by Incucyte video and images. Following the reviewer’s suggestion, we now include new data showing that forskolin (10 μM) treatment for 3 h elevates 5hmC level (now included in Figure 1—figure supplement 2). Furthermore, 5hmC is also increased 24 h after a brief (1 h) cAMP (10 μM) treatment (now included in Figure 1—figure supplement 2). These data suggest that the effect of cAMP could be fast but still needs time for labile Fe(II) elevation, which further activates Tet to generate 5hmC. To understand the impact of 5hmC elevation on transcription, we treated Schwann cells for 7 days based on previous publications that myelinating genes are only expressed after a prolonged treatment (up to 10 days) with cAMP. Please see our response to Essential revisions #3. We have replicated the forskolin washout experiment in HEK-293 cells. The results showed that forskolin treatment (24 hours) followed by washout induced 5hmC elevation at levels comparable to continuous treatment (72 hours) in HEK-293 cells. In contrast, 5hmC levels largely retreated to the base line in shorter forskolin treatments (4, 12 hours) followed by washout. A parallel experiment showed that forskolin treatment (4 hours) followed by washout induced 5hmC elevation at levels comparable to continuous treatment (24 hours) in HEK-293 cells. Compared to Schwann cells, we observed that after treatment of HEK-293 cells followed by washout and assessed at 72 hours, 5hmC levels retreated toward the base line. It is known that 5hmC is not maintained in DNA synthesis and HEK-293 cells replicate much faster than the slowly-dividing primary Schwann cells. Taken together, these results suggest that high levels of 5hmC in cells could be established by cAMP signaling. However, the long-term maintenance of 5hmC requires continuous cAMP signaling. These data are now included in Figure 1—figure supplement 3. The title is now changed to “cAMP Signaling Regulates DNA hydroxymethylation by Augmenting the Intracellular Labile Ferrous Iron Pool”. We included a global analysis of GPCR signaling on myelinating genes or genes involved in Schwann cell differentiation. Our analysis showed that the transcription of 19 genes with known functions in regulating Schwann cell myelination was affected by cAMP treatment. Overall, 13 pro-myelinating genes were upregulated and 6 anti-myelinating genes were downregulated by cAMP treatment. Furthermore, we observed obvious 5hmC peak changes in 10 genes, suggesting the transcription of these genes could be correlated with cAMP-induced DNA hydroxymethylation. For the other 9 genes, their transcription could be regulated by PKA-targeted transcription factors. An alternative explanation could be due to the limitation of hMeDIP-seq by sequencing 5hmC enriched genomic regions using anti-5hmC antibody. These data are now included in Figure 8—source data 1. This work is supported by NIH grants (R01NS089525, R21CA191668 to GW and GM079465 to CJC) and a Craig H Neilsen Foundation grant (M1501061 to PVM). We thank Mr. Chris Gustafson for his technical support on dot blot. GW is also supported by the Dr. Nasser Ibrahim Al-Rashid Orbital Vision Research Center at University of Miami. PVM is supported by The Miami Project to Cure Paralysis and The Buoniconti Fund. CJC is an Investigator with the Howard Hughes Medical Institute and a CIFAR Senior Fellow. ATA. thanks the NSF for a graduate fellowship and was partially supported by a Chemical Biology Training Grant from the NIH (T32 GM066698). © 2017, Camarena et al.